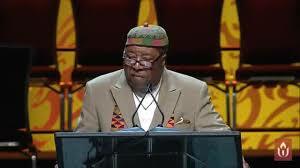 In the 1960s and early 1970s, Unitarian Universalism knew Dr. Mtangulizi Sanyika as Hayward Henry, chair of the Black Unitarian Universalist Caucus (BUUC), a Black Power organization within the Unitarian Universalist Association (UUA). Under his leadership BUUC advocated—initially successfully—for the UUA to dedicate one million dollars to a Black Affairs Council (BAC) to organize and fund projects for Black self-determination around the United States. This funding was highly controversial. Almost as soon as the 1968 Cleveland General Assembly voted on a plan to disburse the money, the UUA’s board of trustees began backtracking on the commitment. 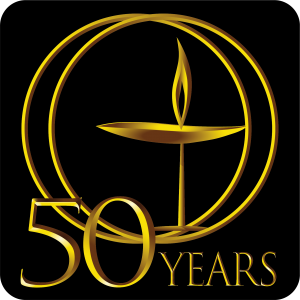 The controversy continued over the next few years, only a portion of the money was disbursed, and as many as 1500 Black Unitarian Universalists left the denomination, profoundly disappointed in the UUA’s inability to fulfill its promises. I had always understood this leave-taking was due primarily to the funding controversy. However, when Dr. Sanyika spoke at the 2017 New Orleans General Assembly, he offered a different interpretation. Dr. Sanyika says the exodus happened not simply because the denomination was unwilling to fully fund BAC. Black people also left for explicitly theological reasons. The UUA, whose dominant theological identity was Humanist, would not make space for Black Humanism. At least some Black UU Humanists were theistic, meaning they maintained belief in God—though clearly not God in any traditional sense—“no spookistic white guy sittin’ up in no sky.” But the dominant form of Humanism in Unitarian Universalism was atheistic. Its theological assumption was, essentially, “there is nothing but humanity.” Black Humanism—at least the strand Dr. Sanyika represents—needed more. “We’ve always said human agency is at the center of transformation, but you can’t do it without divine reconciliation.” Finding no room for such reconciliation in the UUA, they left. I’d never heard this argument before. It shook me up—in a good way. It inspired me to take stock of my own UU Humanist identity and reclaim it. I am a Unitarian Universalist Humanist, yet it has taken me a long time to speak those words with conviction. I have been ambivalent about my Humanism. But we live in uncertain times. We live with a variety of threats to our liberal faith, to democracy, to our health, to our social cohesion, to our planet. This is no time for spiritual ambivalence. I want to tell you about my journey into ambivalence and why Dr. Sanyika’s words have drawn me out of it. As a child in the Unitarian Society of New Haven, most adults identified theologically as Humanists. I understood that to mean a few things. First and foremost, it meant placing human beings at the center of the religious life, specifically free and autonomous human beings. Humanism prioritized free thought, free inquiry, the free and the responsible search for truth and meaning. It embraced the results of science. It allowed and encouraged people to change their beliefs in response to new evidence. Humanism said the individual arrives at authentic, personal belief through the exercise of reason. In our church most Humanists were atheists. Our Humanism removed God from the center of religion. The gods remained available to us as objects of study; but God was no longer the object of worship on Sunday morning, no longer integral to the spiritual life of the community. At its best this atheistic UU Humanism stood for human liberation. At its best it replaced the capricious whims of inscrutable deities and oppressive religious and secular hierarchies with individual human agency and creativity. At the heart of the world’s scriptures, it found poetry and wisdom rather than rigid doctrines and forever-sealed truths. It called for social and economic justice in this life on this earth, not in some future new life on some future new earth. It invited every human being to do their own thinking and feeling on spiritual matters rather than accept without question the pronouncements of religious authorities. At its best. I am forever grateful to this atheistic UU Humanism for imparting to me a strong religious identity, for nurturing me, loving me, instilling confidence in me, and sending me forth into the world with a hopeful, committed heart. So where did my ambivalence come from? We weren’t always at our best. Our atheistic Humanist UU congregation developed a spiritual allergy to any God-talk that approached belief. It got nervous, even angry, around any God-talk that sought to bring God back to the center. We kept our spiritual distance from theism, and although I didn’t recognize it as a child, I learned to not take theism seriously, a message which runs counter to our third UU principles, “acceptance of one another and encouragement to spiritual growth in our congregations.” People who believed in God, especially in a traditional God, were not as enlightened as we Humanists—not as rational, thoughtful, or discriminating in their understanding of ultimate things. We believed believers had been duped, deceived, misled, manipulated. How could they not see it? Their religion was outdated, anachronistic, an opiate, a crutch, a source of ‘pie in the sky,’ but not true spiritual freedom, not liberation. Their God was that spookistic white guy. Wouldn’t they be more happy not having all the answers? Nevertheless, as a child, and even as a college student, I didn’t recognize the distance between myself and traditional theists—or any theists for that matter. It wasn’t until I entered seminary in the 1990s that I began to question my atheistic Humanism. Seminary was the first time I had to defend my religious identity in a diverse, interfaith community where people with more traditional views of God were visible, vocal, progressive and intelligent. This was the first time I encountered theists who were thinking deeply about God, reasoning, arguing, weighing evidence, not accepting without question, even contemplating atheism. And their faith was flourishing. I began to understand that theism isn’t one thing, that God isn’t only the spookistic white guy up in the sky. In fact, I never meant anyone who believed in that guy. I loved the religious identity of my childhood, but I realized that clinging to it too tightly in the seminary environment might actually prevent me from engaging in the free thought and interplay of ideas I valued so highly. Slowly, I began to suspect that, along with humanity, there might be a place for God at the center. Through the course of my seminary training and into the early years of my ministry, I discovered truths about the human experience which hadn’t been offered to me as a child, and which ultimately made my atheistic UU Humanism feel inadequate. There were moments wherein my rational mind just didn’t cut it. There were moments of heartbreak and pain, vulnerability and fear—my own and that of others—and there were no adequate words to say, no evidence to weigh, no inquiry to conduct. In such moments all I could do was trust—without any evidence—that I or they would eventually arrive at the other side of heartbreak and pain. There were moments of decision, moments when I could no longer stay in whatever pattern I was in; moments in which I needed to change; moments in which, no matter how much I prepared, I was not ready. I could not reason my way to an answer, could not anticipate what the full impact of my decision would be. All I could do is surrender, let go and fall into something new. There were moments of intense joy, hope, love and there were no words! Just energy flowing, spirit animating; the recognition that I was experiencing a reality vastly larger than me. There were moments wherein I was arrogant, prideful, smug and I needed some power beyond me to sit me down and counsel me on the virtue of humility, to demand that I stop talking and start listening. There were moments of awe in the presence of beauty, and the only possible response from me was reverent silence. And there were moments when I thought I was carrying myself, but suddenly realized never in my life had I ever carried myself alone. Communities carried me. Ancestors carried me. The earth carried me. Flowing energy and animating spirit carried me. I realized my life is carried, held, fed, nurtured, challenged by countless realities larger than me. Humanity, I realized, isn’t alone at the center of religion. I became comfortable using the word God to name the totality of these larger realities. I became a theist. I didn’t jettison humanity from the center—that would be folly. I simply put God back. Our childhood spiritual lessons run deep. For me, Humanism was atheistic. I thought I had to lay it aside. That has been the source of my ambivalence. Of course, my ambivalence isn’t rational. I’ve always known you could be a Humanist and a theist. The Unitarian Universalist Humanist Association states clearly there is room for theism within Humanism. I just haven’t used the Humanist label, perhaps out of respect for my atheistic Humanist UU elders. But my ambivalence hasn’t been serving me well in these uncertain times. It’s as if a part of me is missing, though I didn’t fully realize that until I heard Dr. Sanyika say “We’ve always said human agency is at the center of transformation, but you can’t do it without divine reconciliation.” At that moment I knew I wanted my Humanism back. Of course, I cannot claim a home in Black Humanism. That’s not my journey. I am also mindful that some Black Humanists are atheists. And I also am not suggesting that atheist UU Humanists—or any atheists—ought to become theists. I continue to support atheists in this congregation and elsewhere, and I will continue to speak out against the marginalization of atheists in American public life. But I know this about me: While I need humanity at the center of my religion, I also need clarity about what realities larger than me are carrying me—what communities, what ground, what land, what ancestors, what beauty, what spirit, what visions of the future carry me? Coming to such clarity and letting it guide my life is a form of divine reconciliation. I will always need humanity at the center of my religion, but when pain, heartbreak, vulnerability and fear are ascendant, I also need realities larger than myself into which I can place my trust. When life-changing decisions must be made without knowing fully the consequences of those decisions, I need realties larger than myself to catch me as I surrender, let go, fall. Learning to trust such larger realities is a form of divine reconciliation. I will always need humanity at the center of my religion, but I also need sources of joy, hope and love larger than myself. Learning to draw on such sources is a form of divine reconciliation. I will always need humanity at the center of my religion, but I also need realities larger than myself to quiet me, center me, ground me, surround me with silence, beseech me to listen, and keep me humble. Bowing down to such realities is a form of divine reconciliation. I will always need humanity at the center of my religion, but I also need realities larger than myself to inspire and embolden me to take action for justice and liberation not only for my human siblings, but for the earth and all its creatures. Taking such action is a form of divine reconciliation. I am a Unitarian Universalist Humanist. I say this with no ambivalence. Knowing that we live in uncertain times and with news of white nationalists and neo-Nazis marching in Charlottesville, each of us needs every piece of ourselves to remain clear about what’s happening, courageous in our actions, and spiritually whole, so that we respond at our best. To learn more about Dr. Sanyika, I recommend this powerful, short 2015 film by Darius Clark Monroe entitled Two Cities: A Portrait of Dr. Mtangulizi Sanyika at https://vimeo.com/137993474. One of the more well-known recipients of an early BAC grant was Dr. Maulana Karenga, the creator of Kwanzaa. For a historical timeline of the controversy, see: http://www.uua.org/re/tapestry/adults/river/workshop15/178882.shtml. Dr. Mtangulizi Sanyika, address to the Unitarian Universalist Association General Assembly, June 23rd, 2017. See: http://smallscreen.uua.org/videos/ga2017-303-dr-sanyika-presentation. For a relatively recent article on Black Humanism, see Pinn, Anthony B, “Anybody There? Reflections on African American Humanism,” Journal of the HUUmanists Association, vo. 31, #3, 1997. http://huumanists.org/publications/journal/anybody-there-reflections-african-american-humanism. See the ‘frequently asked questions’ section of the Unitarian Universalist Humanist Association website at http://huumanists.org/faq-page#n4639.